Microsoft Dynamics 365 transformations are tricky. It doesn't help that system integrators and other players in the Dynamics ecosystem aren't able to consistently provide the vision and best practices required for success. This is where the Microsoft Dynamics 365 Transformation Boot Camp will help. 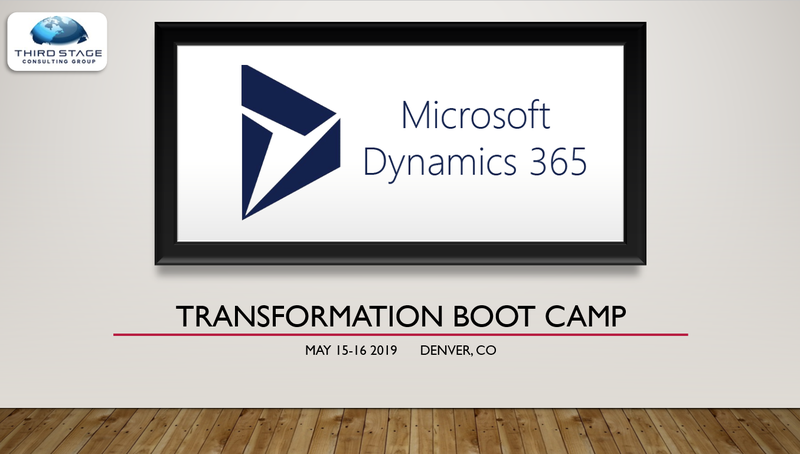 Hosted by Eric Kimberling, a Dynamics and ERP implementation veteran who is currently helping some of the largest organizations through their transformations, this boot camp will help get your team on the path to success. Attendees will also receive a 50% discount to attend our Digital Stratosphere digital transformation conference in Chicago on August 7-9, 2019. Attendees have the option of joining live in person, remotely via web conference, and/or accessing recordings of the sessions on demand. The fee for this deep-dive training will be $495, or complementary to registrants of Stratosphere 2019. Please enter your contact info in the form provided, where you will be directed to a secure payment page. Questions? Feel free to contact us at tracy.pujia@thirdstage-consulting.com for more information or details.